Debbie Ferguson-McKenzie has been considered one of the most decorated Bahamian female athletes in the history of track and field, having won all three colour medals at the Olympic Games and the International Association of Athletic Federations World Championships. 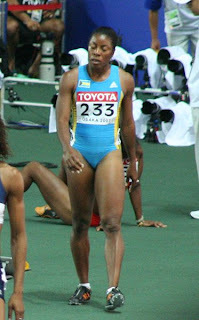 During the 2009 outdoor season, Ferguson-McKenzie said her main goal was to break the 22 second barrier in the 200 meters becoming the first Bahamian female athlete to do so. She was not able to accomplish that goal this year but she was able to secure a bronze medal in the 200 meters, and a silver medal in the 4x100 meter relay at the Worlds. In an interview with the Bahama Journal, Ferguson-McKenzie started by saying "to God be the glory, great things he has done," which she says sums up her 2009 outdoor season. "In terms of times this has been one of my best seasons. As I look back at the 100 and 200 meters all of my times have been respectable; even at the end of the season when I was tired I still ran descent times and it has been a blessing," she said. Running under the 22 second barrier is still in site for Ferguson-McKenzie and she says she will go at it again in 2010. "The thing for me next time is to run the 100 and 200 meters on the outdoor circuit but at any major championship, my goal is just to run the 200 meters. If I had done that in Berlin at the World Championships I believe it would have been under 22," said Ferguson-McKenzie. Her National Record in the 200m stands at 22.19 seconds. She said her training begins in November towards breaking the record and dipping under 22 seconds. At the World Championships in the semifinals, Ferguson-McKenzie ran 22.24 seconds coming within a few strides of breaking her National Record. "It was very easy when I ran the 22.24 seconds in the semi-finals in Berlin. In that race it was a matter of, if I should beat my training partner (Veronica Campbell-Brown) or not, but I said to myself you know what just run for a good lane. It was really easy, and honestly I felt like I could have broken the National Record but sometimes with the run you want to take it as easy as possible and reserve some of that energy," explained Ferguson-McKenzie. As for 2010 she said she hopes to remain healthy and train hard with her new partners Campbell-Brown of Jamaica and Tyson Gay of the United States of America under Coach Lance Brauman.